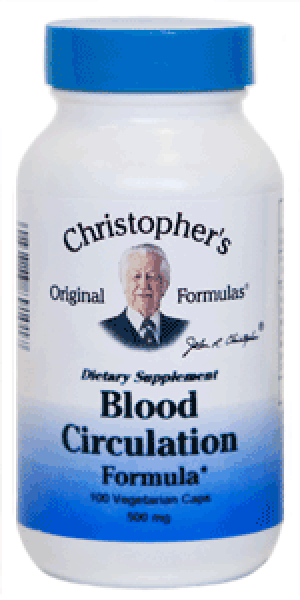 Dr.Christopher's Blood Circulation Formula is designed to nourish vein health & support optimal blood flow to the heart & legs. Dr. Christopher's Blood Circulation Capsule (B/P or BPE) is fully based on natural plant products and is applied in the treatment of blood circulation diseases. The remedy contains natural extracts that have unique properties contributing to the strengthening of the walls of blood vessels and improving of overall blood flow. Blood circulation is a core factor of our physical health. This is something like the work of our brain, and hence the work of the rest of the body depends on it. Poor blood circulation results in improper functioning of internal organs; therefore, it is at the root of many serious diseases. Blood vessels tend to lose elasticity with age. Blood Circulation Capsule contains ingredients that nourish vascular walls and prevent deterioration, producing a rejuvenating effect on the entire body. The medicine is composed of natural extracts of ginger root, cayenne pepper, goldenseal root, parsley root, garlic bulb, and eleuthero root, which have been used against blood disorders in folk and professional medicine for centuries. Blood Circulation Capsule is an all-in-one herbal remedy applied for the treatment of a vast number of diseases, including but not limited to blood circulation diseases. It has freed many people of allergies, blood pressure disorders, indigestion, eye problems, orthopedic issues, tumors, infections, etc. Particularly, Blood Circulation Capsule is irreplaceable in battling the consequences of diabetes. If taken regularly and as directed by a qualified doctor, it reduces the risk of acute diseases, alleviates symptoms, and may shorten the run of a disease. Blood Circulation Capsule does not contain any aggressive chemicals and therefore does not have nasty side effects. All components and ingredients are naturally extracted from medicinal herbs. Now, let's consider three components in detail. Cayenne Pepper is one of the key ingredients of the remedy. Due to its unique ability to penetrate deep into tissues and prodigious antioxidant properties, it produces a wonderful invigorating and empowering effect. Besides, it facilitates the supply of nutrients to all layers of skin and internal tissues and speeds up metabolism. All these factors are crucial for the betterment of vascular walls and overall blood circulation. Ginger Root is another key element of the Blood Circulation Capsule. It has a broad spectrum of effects and is well known for bactericidal, anti-inflammatory, healing, and sedative properties. Besides, it boosts the immune system and fights parasites and fungi. Ginger root stimulates gastric secretion and improves appetite, which is the core of general health. Just like cayenne pepper, it helps strengthen blood vessels and intensifies cranial blood circulation. Ginger root is also known to relieve blood pressure and treat atherosclerosis. Garlic Bulb extract is another excellent antiseptic and antibacterial element of the remedy. It treats disorders resulting from staphylococcal and streptococcal infections and can be used effectively against dangerous tropical infections. It has a direct impact on the blood system and reduces blood viscosity. Garlic bulb lowers cholesterol, battles atherosclerosis and thrombophlebitis, and lowers blood pressure, thus preventing heart failure and strokes.